As great as Bryan Hill's work has been on Top Cow/Image Comics' Postal, he surpasses those efforts with an impassioned new book that's action-packed, fast-paced, a veritable blockbuster film told in sequential art. 'Romulus' is the next great comic book action thriller. There are times when you can sense through the pages of a comic book when a writer is passionately invested in his work. That's not to say most aren't but with 'Romulus,' I can easily imagine Hill frantically typing on his keyboard in the wee hours of the night pouring his soul into the script. It's so cleanly executed and well-paced you can tell it was written and re-written until it was sharpened into a razor-sharp point. But what is it about? Ashlar is a trained assassin, a wolf from the order of Romulus, carrying the legacy of her mother who instilled in her the heart of a warrior. The order is a secret organization that has shaped history since ancient times using death to steer the winds of change. Now it's turned on their very own wolves and it's up to Ashlar to thwart their deadly crusade. The exposition is so crisp and concise yet almost poetic as the story quickly establishes Ashlar's origin story through her training, going on the run, facing adversaries, until the dramatic ending. 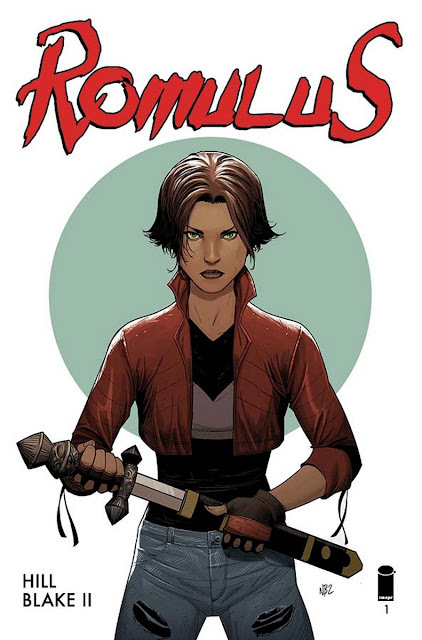 If you're looking for a template on how to begin a series in the best of ways, 'Romulus' should be your guide. Since the series was first teased with images from 'Romulus' artist Nelson Blake II, I knew the art was going to be smooth, kinetic, and dynamic. Blake perfectly conveys the array of emotions that befall Ashlar through her transformation into a fine-tuned killer. His fight choreography is clear and impactful. It's a technique that is so hard to find in many artists, even veteran ones, where fight scenes can sometimes look muddled or confusing but Blake maximizes each panel with well-defined blows, kicks, and knife-work. There's a reason Hill and Blake were so anxious to get 'Romulus' released and on October 5th you'll be able to get your hands on it. It's a freight train of entertainment that will leave you wanting more. It's a tried and true formula of a trained assassin fighting against enormous odds. It's off to a fantastic start and already belongs in the same breath as Greg Rucka's Lazarus and Ed Brubaker's Velvet.